Attain the minimum cut off marks or more in OPENMAT Entrance Exam Conducted by IGNOU. Meet the eligibility requirements for admission to the management programs offered by IGNOU. Read the sections below to know more about the steps involved in getting admission in IGNOU for MBA. This is the overview of the 5 steps that you have to go through while getting admission to distance MBA program. Click on each step to read more in detail. You can also watch the animated video below to know more about the steps involved in admission. Firstly, before attempting to get admission, You should verify the eligibility criterion requirements for admission. Graduation is the basic eligibility criterion for admission to IGNOU distance MBA. To know in detail about the eligibility criterion click here. If you meet the requirements then check the next step. Download it from the IGNOU official website.If you decide to take this route then you will have to pay the application fee when you apply with the Form from the downloaded prospectus. The Fee is ₹ 1,050 and should be drawn as a demand draft in favor of IGNOU payable at New Delhi. It should be attached along with the filled in Application Form. You can also obtain the prospectus from From Regional Centers or Study Centers or IGNOU Head Quarters on payment of ₹1,000. The candidates can also obtain the prospectus by post, by requesting for the prospectus along with a Demand Draft drawn in favor of IGNOU payable at New Delhi. Step 3: Apply online for OPENMAT online. Now you can apply for OPENMAT exam online through IGNOU website. Previously this was done using an offline application form. Now applications to OPENMAT can ONLY be done online. You should fill and submit the online application before the last date of submitting the OPENMAT Form. The dates are given above. Very Important: Keep a Photocopy of all the application forms you send to IGNOU. This will be helpful for future references. After you have sent the application form for OPENMAT, you should start preparing for the exam. You can download the admit card (hall ticket ) from INGOU website (http://ignou.ac.in). The admit card will be uploaded to the IGNOU website 10 days before the OPENMAT Exam. You can know the result of the exam through IGNOU website or through the score card sent to you by IGNOU. Once you are qualified in the OPENMAT exam by scoring the cutoff mark or above, you can proceed with Step 6. This step assumes that you have already qualified in the OPENMAT exam. Category Certificate in the case of SC/ST/OBC students. You should also include the Program Fee as a Demand Draft or Bank Challan drawn in favor of IGNOU payable at the place where your Regional Center is located. The forms for the Experience Certificate, Category Certificate, Identity Card etc are available towards the end of the Prospectus. Use them while obtaining the certificates from the authorities concerned. 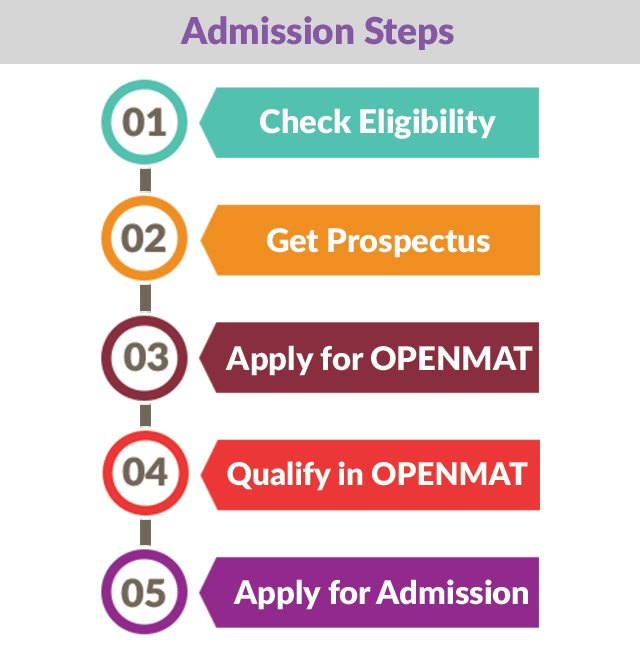 If qualified for an OPENMAT, you can seek admission in any one of the two subsequent Admissions. For Example, In the case of OPENMAT XLIV , you can take admission to either of the semesters starting in January or July of 2019. You will be given admission after IGNOU Regional Center verifies your certificates and after confirming your eligibility and other procedures. Once you are given admission you can start attending the counselling sessions and other course activities as per the schedule of operations given in the prospectus. Even if you meet all the requirements above, the decision of allowing you admission is taken by the university. They can either accept or reject you. It should be noted that this is not at all an issue in the normal cases. Here we have made an explainer video explaining how to get admission to IGNOU’s correspondence MBA. We have created the image below summarizing the steps involved in admission. You can download the image to your device for easy referance.